Private Branch Exchange (PBX) is a private telephone system used within an organisation. It allows users within the organisation to manage incoming and outgoing phone calls. In a PBX phone system, users will share a certain number of outside lines, these lines are used for making external calls. The PBX is connected to the phones within in the company and connects them to the public via VoIP providers, SIP Trunks and telephone networks. Hosted PBX is a service in which an organisation’s phone system is hosted at the service providers location. The service provider, for example, Packnet, is responsible for housing the phone system, its hardware, software, call routing, switching and any maintenance the phone system may require. A Hosted PBX also allows users to utilise features such as voicemail, automated greeting and many more. Hosted allows a business to expand and contract as required without having the liability of high ongoing contractual fees, you pay for what you use at all times. When you have a Hosted PBX, you may need to remove or add extensions, and typically this does require training. Problems may occur if you don’t have any staff experienced with technology, however, if your provider maintains the system for you, then this will not be a problem. A hosted PBX is a great choice for an organisation with more than one location or one with employees that travel frequently. All employee extensions will be under one system. 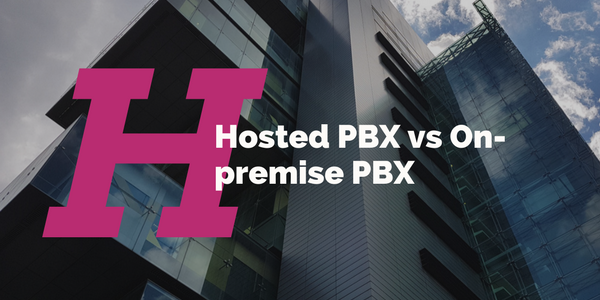 Hosted PBXs are less vulnerable to power and internet outages during harsh weather. Usually your service provider will have network redundancy to make sure that in case anything happens there will be back up. Often there will be an accompanying online portal which you can use to administrate your account. Your platform is always up to date and you always get immediate access to the newest features meaning no expensive upgrades or new license fees. Click here to read more about Packnet’s Hosted solution. An On-premise PBX is a PBX phone system located within the premises of an organisation – meaning that the organisation is wholly responsible for it. Having a PBX is all well and good but it still has to connect to a VoIP provider. The on-premise PBX usually connects to your VoIP provider via SIP Trunking. This allows it to make and receive calls using your VoIP provider’s service. For a stunning on-premise PBX, we recommend 3CX. 3CX offers its users a multitude of voice services and features bound to make communication within your business a unified experience. Click here to read more on 3CX. Usually with power comes great responsibility. With an On-Premise PBX, all responsibility for the maintenance and upkeep of your system usually falls on the shoulders of your organisation. If your organisation cannot handle the constant task of maintaining and dealing with extensions then you may have to pay a monthly maintenance fee, or a Hosted PBX may be the better option. Unlike a Hosted PBX, the initial charge and set-up costs of an On-premise PBX will be higher and you’ll also have to fork out the money for maintenance. In addition to that, you’ll need an appropriate space to keep your system powered and secured. While all the responsibility of the phone system lies on your company’s shoulder, it’s still great to know that you are in control of your own phone system. This means that you can adjust the phone system to whatever your current needs are. Whilst the upfront costs are higher, as a company you may be more comfortable with making a one time purchase, rather than committing to a monthly fee. Many On-premise PBXs charge you for simultaneous calls rather than extensions. This is a particular advantage for larger companies.